Many people are concerned about TSP. The problem is obvious. If you don’t have enough saved in TSP, your retirement could be very uncomfortable. There’s mountains of information out there about TSP. But it’s complex and you’re left to sift through it all to come up with action steps. Am I saving the right amount in TSP? The Thrift Savings Plan (TSP) is a long-term retirement saving account that’s very similar to a 401k in the private sector. The TSP is called a defined contribution plan because its results depend upon how much you save and how your investments perform. The higher your account balance, the more money you have for retirement. You save money in TSP each pay period by payroll deduction; it’s referred to as a contribution. The amount you contribute is determined by you. You can use either a percentage of your pay or a specific dollar amount. However, the IRS sets a limit every year on the maximum contribution you can make into TSP. There are two types of contributions: Regular Contributions and Catch Up Contributions. There are different rules for each. Regular Contributions are available to all eligible employees (regardless of their age). In 2018, the maximum annual Regular Contribution is $18,500. You can make contributions into Traditional TSP and/or Roth TSP in any combination you wish, but the total cannot exceed $18,500. Catch Up Contributions are an extra amount above and beyond the Regular Contributions, if you meet the requirements. You can start making Catch Up Contributions at any time beginning in the year you turn 50. You must also be on track to reach the maximum Regular Contribution for the year. In 2018, the maximum Catch Up Contribution is $6,000. If eligible, you can make contributions into Traditional TSP and/or Roth TSP in any combination you wish, but it cannot exceed $6,000. Your Regular Contribution automatically carries over year to year until you change it. However, you must re-elect Catch Up Contributions each year. Note: The TSP contribution limits do not include any FERS Match. The FERS Match is a separate amount that doesn’t impact TSP contribution limits. A strong TSP account balance starts with good, steady savings habits year after year. The people who are able to save the most usually follow certain success habits. Every year at about this time, they review the next year’s TSP contribution limits and they calculate how much they’re currently saving. To figure out how much you’re saving in TSP this year, you’ll need your current Leave and Earnings Statement, a calculator and a pen and paper. Step 2: Starting with Regular Contributions, multiply your TSP Regular Contribution x 26 pay periods. Repeat this step for Roth TSP Regular Contributions. Add the two together to determine your total annual Regular Contributions. Step 3: Next calculate your Catch Up Contribution, if applicable. Multiply your TSP Catch up Contributions x 26 pay periods. Repeat this step for Roth TSP Catch Up Contributions. Add the two together to determine your total annual Catch Up Contributions. Note: Some years you will have an extra pay date, meaning you’ll receive 27 paychecks. For this exercise, the standard 26 pay periods are used. 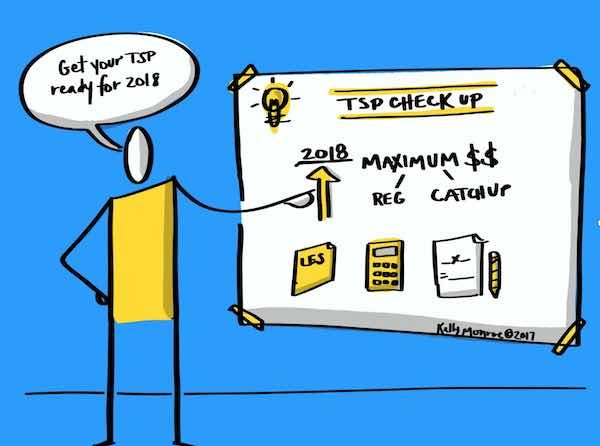 Brainstorm ways that you can reduce some day-to-day spending and increase your TSP savings in 2018! Small changes can bring big results. For instance, how about bringing lunch from home once or twice a week instead of buying lunch at work. Or skipping the daily latte drive thru, bringing your coffee from home. Write down your 2018 TSP savings goal and figure out the steps you’ll take to reach it. The better you take care of your TSP now, the better it can take care of YOU in retirement! Will you be ready to retire? As a FERS employee, your TSP savings can help you stay secure in retirement. Get this benefit guide The TSP Check Up, to use as a handy reference guide for retirement planning. What If FERS Changed? Can You Still Retire Comfortably? Does the TSP's Annual Contribution Limit Include the Agency Match?